The current show at Eleven Twenty Projects is a mixed bag comprising a large sculptural construction, photographs, and appropriated videos of a kind of performance art—in the way the Christians’ part in the Roman Colosseum extravaganzas—with the lions and tigers—could be considered performance art. Footage of sudden and unexpected wild animal attacks on humans in safari or zoo situations when somebody—whether staff person or patron—finds himself in mano-a-mano encounter with one of the animals—large felines, invariably—from which humans would ordinarily be separated by fences or bars. Work certain to evoke the perennial wrong question: Is it art? A more pertinent question would be: Is it interesting? Answer: Extremely. The wild animal attack footage, that is. The sculpture and photography and other show elements not so much. 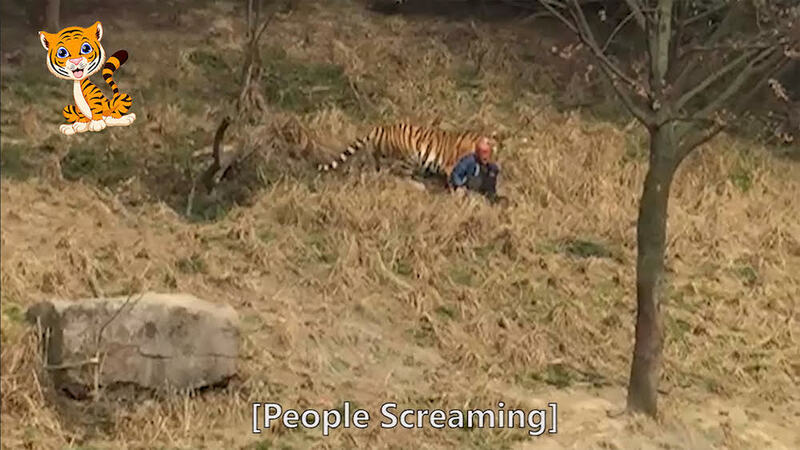 In one case, a zoo patron has apparently fallen into the deep trench area around the tiger habitat—a lot like the tiger habitat at the Buffalo Zoo, but not the Buffalo zoo—and is cringing and waving his arms as if to ward off the tiger, who has climbed down to confront him—maybe partly out of curiosity, partly because the animal is hungry. Which works for a minute or so—the waving him off—before the tiger gets tired of that game and grabs the guy and drags him off like a rag doll into the woody obscure recesses of his habitat area for a quiet meal. In another, a guy is trying to climb over a high wall to escape a leopard, but the animal leaps up and claws him back down, and mauls him somewhat, whereupon we see—from the other side of a chain-link fence—a guy with a rifle. But it’s hard to get off a shot at the animal mixing it up with the guy without accidentally shooting the guy instead. (As with many of the attack videos, such herky-jerky camera work, and ill-focused—and things happen fast—that it’s hard to tell moment to moment just what’s going on.) Finally—apparently—the rifle guy has risked a shot, and hit the leopard. A possible bullet wound dark blossom is noticeable on the animal’s shoulder. Which doesn’t bring him down, but merely distracts him a few seconds, but then seems to just piss him off, and he resumes the mauling in earnest. In another, apparently at an African wildlife preserve, where you’re probably instructed not to get out your car, several cars are stopped along a roadway—no doubt to observe some active wildlife in the vicinity—and a lady in a front passenger seat decides it’s a good time to switch seats with the driver, and opens her door and gets out and runs around the car and opens the door on the driver’s side, and before she can scramble back into the car, a big cat—species unclear, it happens so fast—leaps out of the bushes and grabs her and drags her off to dinner. Then in maybe a related scenario, a man gets out of his car with a film camera and crouches to get some footage of some unseen subject matter, when a big cat leaps onto his back and grabs him by the head and neck and drags him away. Confused footage then of a kind of cat family squabble, a half dozen or so animals fighting over the corpse. Or when a large feline personal pet—on a leash—suddenly turns frisky and attacks its owner/minder at the other end of the leash. Or in another instance, a leopard strays into a peasant village in India and for several minutes has the entire community at bay, as various village men try to fend him off with sticks, not very successfully. We only see segments of the videos, usually not the ultimate outcome. None of the work on show is ascribed to a particular artist, but the show is a collaborative project of three artists—Jon Eisenberg, David Mitchell, and Joseph Stocker—going by the name Weimar Safari Guild. Other items than the attack videos include banal photos of exotic locales—tropical islands, ocean waters—with handwritten comical—but not excessively funny—captions, and the sculptural creation, a sort of post-shipwreck survival raft with makeshift tent for shelter from the elements, and improbably, a laptop computer with a sweet but grim puppet show video about a boy and a tiger. The show conceit seems to be that we are on a safari—or better, the artists are on a safari—loosely defined. But a key element of the definition, dangerous. As in South Seas voyage—sort of a safari—or the more usual safari case of African or Asian venture in quest of large wildlife. Or maybe the municipal zoo. (Dangerous if you’re going to lean over the fence too far and fall into the tiger pit. Or for the African or Asian model, if you’re going to get out of your car in circumstances where they told you don’t get out of your car.) But whatever. As pretext to shoehorn in the animal attack videos, which are spectacular. But overwhelm the other parts of the exhibit, which aren’t. Nor do the parts seem to add up to a whole. The exhibit is entitled P.S. we still have yet to find our way off this island. It continues until July 20.